BERLIN: British Prime Minister Theresa May on Tuesday met Angela Merkel to seek support for a new Brexit delay while her ministers tried to break the deadlock in London at crisis talks with the opposition Labour Party. More than a week after the United Kingdom was originally supposed to have left the European Union, the weakest British leader in a generation has said Brexit might never happen as she battles to get a divorce deal ratified by a divided parliament. 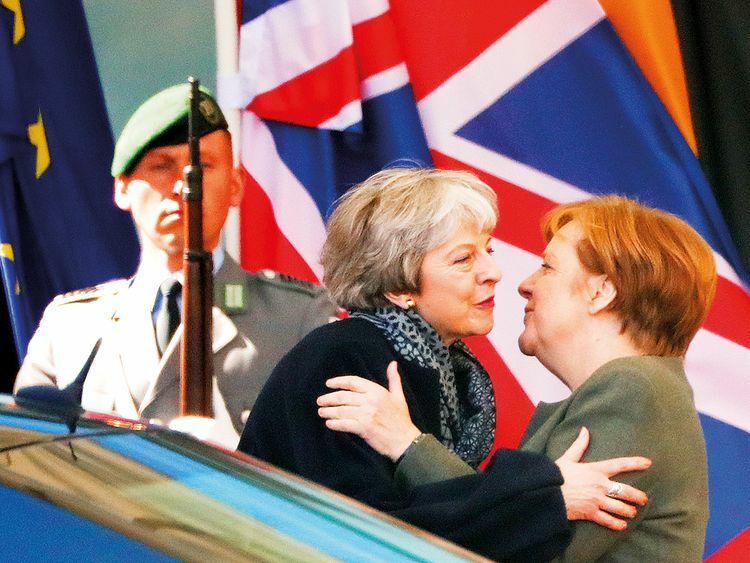 With little sign of a resolution in London, May dashed to Berlin ahead of a meeting with French President Emmanuel Macron, to seek support for her request to delay Brexit a second time, from April 12 to June 30. May met Merkel at her riverside Chancellery, a short walk from the Brandenburg Gate, where Ronald Reagan in 1987 urged Mikhail Gorbachev to “Tear down this wall!” — the barrier that had divided West and East Berlin since 1961. While Merkel and May discussed Brexit inside, the opposition liberal FDP party drove an advertising van past the chancellor’s office with a message for May: “Dear Theresa May. Just do it. Stop Brexit. Make the most of Europe’s opportunities.” On the eve of an emergency EU summit in Brussels, chief EU Brexit negotiator Michel Barnier said the bloc was ready to grant a delay, but that the duration “has got to be in line with the purpose of any such extension”. “No-deal will never be the EU’s decision. In order to avoid no-deal, the UK needs to agree to a deal,” Barnier said. Meanwhile in London, lawmakers were due to debate her Brexit delay proposal. The debate was forced on the government by parliament passing a law on Monday giving lawmakers the power to scrutinise and even change May’s request that the EU agree to delay Brexit until June 30. EU ministers discussed their conditions for any long delay, which include Britain holding European Parliament elections in May and committing to “sincere cooperation”, or not undermining EU reforms and institutions should it stay a member for longer.